The Model LP is an ergonomic vertical lifting clamp capable of turning a single plate or member from horizontal to vertical to horizontal through a 90 degree arc. 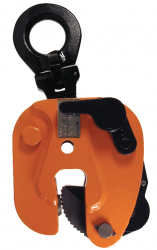 Permits side loading of lifting shackle to 90 degrees by de-rating of clamp’s capacity. The “Lock Open – Lock Closed” feature facilitates attaching and removing the clamp from the plate. 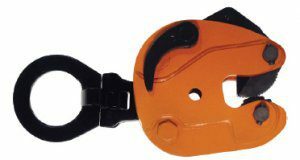 Model LP incorporates a pivoting shackle that permits side loading of the lifting shackle at 100 percent of rated capacity from vertical to 30 degrees, 75 percent of rated capacity between 30 and 45 degrees, and 50 percent of rated capacity between 45 and 90 degrees.